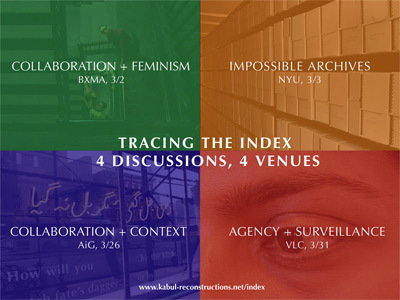 Tracing the Index is a four-part series of roundtable discussions organized by Index of the Disappeared (Chitra Ganesh + Mariam Ghani), hosted and co-sponsored by the Bronx Museum of the Arts, NYU’s Kevorkian Institute, the New School’s Vera List Center for Art + Politics, and Art in General. The series brings together artists, activists and scholars to discuss ideas and areas of inquiry central to their work and to our collaborative project. All roundtables in the series will be recorded and made freely available online. We will also transcribe, edit and eventually publish the discussions, both online (check back at this URL for video, audio and text in later months) and in a forthcoming Index print publication. You can download the entire series program booklet as an 8MB PDF here or see the program notes for individual roundtables via the links above. This series is primarily focused on fostering the exchange of ideas, rather than introducing new work to new audiences (though we hope you may be intrigued enough by these artists’ ideas to seek out their work). For this reason, all the programs will have a roundtable rather than a presentation panel format. Participants will briefly introduce themselves and/or their work, and then participate in a moderated discussion focused on topical questions. The second hour of each roundtable will be open to questions from the audience. Chitra Ganesh + Mariam Ghani have collaborated since 2004 on the project Index of the Disappeared, which is both a physical archive of post-9/11 disappearance and a mobile platform for public dialogue. As an archive, the Index traces the difficult histories of immigrant, other and dissenting communities in the US since 9/11, and the ways in which censorship of speech and data blackouts create real absences in real lives, by collecting and connecting documents and testimony. As a platform, the Index presents discussions on ideas and issues related to the materials it archives, and stages interventions that translate those materials into visual elements installed in a range of physical and virtual spaces - including galleries, museums, universities, community centers, libraries, conferences, magazines, books, windows, the street, the web and the mail. These new forms of public dialogue are designed to confront audiences with the human costs of public policies, challenging them to re-consider the abstractions of political debate through the specific details of personal experience. Recent Index projects include presentation of the complete archive, along with a reading/writing lounge and public program series, in the UBS corporate headquarters for the exhibition 25 Years Later: Welcome to Art in General (fall 2007); a multilingual installation of text fragments from the archive in large-scale neon and vinyl in Exit Art’s windows (August 2007); and a critical text published in Pavilion Issue 11 (What Was Socialism, and What Comes Next) as part of the Documenta 12 magazine project (spring 2007). Details, documentation and updates can be found here. Video and audio from the most recent Index archive orientation session (October 2007 at UBS) can be found here. Supported by the Vera List Center for Art & Politics at the New School, the Kevorkian Center at NYU, and the Bronx Museum of the Arts. Special thanks to Carey Lovelace, Amy Mackie, Ashraf Ghani, Shiva Balaghi, Sergio Bessa, Carin Kuoni, Winslow Hinds, Bill Carrick, Liliane Thorpe Buchanan, Meghan DellaCrosse, Greg Sholette, Lex Bhagat, Naeem Mohaiemen, and the South Asian Women’s Creative Collective.